Lobe-finned fish possess a pair of lungs and a fin structure with obvious homologies with the tetrapod limb. The seven relict species are the freshwater lungfish (infraclass Dipnoi) and the marine coelacanth (infraclass Coelocanthimorpha). The three families of lungfish each have a restricted and distinct geographical distribution. 3. Protopterus (Family Protopteridae, 4 species). This genera comprises four air-breathing species in Africa. African lungfish are more carnivorous than the other types of lungfish, they eat molluscans, crustaceans and some fish. If these lungfish are prevented from reaching the water�s surface to breathe they will drown. Like Lepidosiren paradoxa, they can survive for long periods of drought by aestivation. 4. Mud tube of Protopterus sp. As the swamps recede during the dry season, African lungfish dig burrows in the mud which they line with mucoid secretions to form a hard cocoon. The lungfish leave a small hole so they can breathe and for water to enter the burrow when the rains return. When this happens, the water enters their lungs, the fish cough and wake up. 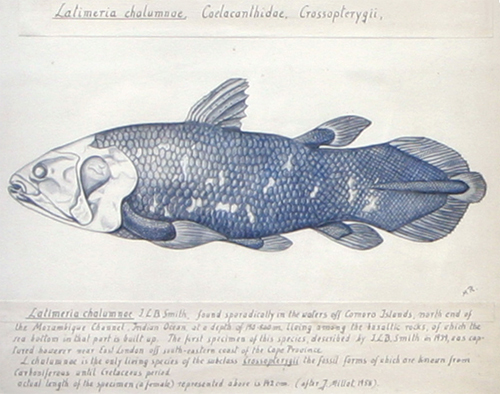 Water-colour of a coelacanth, Latimeria chalumnae (Family Latimeriidae) by M. Ramult. This painting shows the major features of a coelacanth � the three-lobed tail, forward placed dorsal fin, large cosmoid scales. Coelacanths live at depths of 150 � 200 metres off the Comoro Islands in the Indian Ocean, where they may grow to 2 metres in length. Until 1938, ichthyologists thought that coelacanths were extinct because the most recent fossil was 70 million years old. The fish appeared to have evolved in fresh water, moved to shallow marine environments and then disappeared from the fossil record. In 1938 a living coelacanth was caught off South Africa and then in 1952 it was discovered that coelacanths were well known to fishermen in the Comoro Islands, who call them gombessa and consider them a worthless catch. The first scientific observations on living coelacanths made with a small submarine revealed that the paired fins are used for stabilizers as the fish drift in the currents with their heads pointing downwards. During the day, coelacanths rest quietly in caves. They feed at night on large benthic fish, including sharks. Female coelacanths retain their eggs in their bodies where the eggs hatch and the young develop. Reconstruction of Eusthenopteron. Early sarcopterygians, such as Eusthenopteron (Family Rhizodontidae) or Osteolepis (Family Osteolepidae), living in the Devonian period were in many ways intermediate between fish and the early amphibians, the labyrinthodonts, that first appeared in the Devonian period. These primitive sarcopterygian fish were armoured, air breathing predators of tropical freshwaters environments. Their lobe-fins contained a series of bony elements linked to the pelvic and pectoral girdles that were much like tetrapod legs. Their jaw suspension connected directly to the brain and their teeth resembled those of the labyrinthodonts. These resemblances suggest that such early lobe-finned fish represent the stock that gave rise to the first amphibians.